Dubai Investments Park, the wholly owned subsidiary of Dubai Investments PJSC, received ghaf trees from a Dubai Land Department delegation and held a symbolic planting ceremony as part of a planned calendar of initiatives and activities that underlines a commitment to the Year of Tolerance at Dubai Investments. 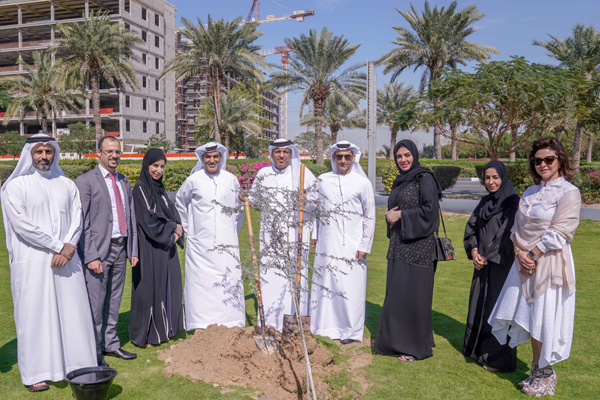 The DLD delivered the young ghaf trees, the national tree of the UAE, in a symbolic planting ceremony in front of Dubai Investments House in the presence of Dubai Investments management. Omar Al Mesmar, General Manager of Dubai Investments Park, Obaid Mohammed Al Salami, General Manager of Dubai Investments Real Estate Company and Dr Rashid Abdulla Al Haji, General Manager of Properties Investment, were in attendance along with Majida Ali Rashid, CEO of Real Estate Investment Management and Promotion Centre at Dubai Land Department, a delegation from Dubai Land Department and representatives from Dubai Investments. Al Mesmar said: "The Year of Tolerance is important to us all as part of the Dubai Investments plan, and this special ceremony is part of a larger commitment which will present itself in a calendar of planned events and activities reflecting our positive attitude towards co-existence." "This outlook is very much apparent in the diverse cultures who make up the Dubai Investments family," he stated. “We would like to thank the Dubai Land Department for the ghaf trees that they have brought to us. Last year approximately 3,000 trees, including 300 ghaf trees, 20,000 shrubs and 20,000 square meters of lawn grass were planted in DIP and other areas across the emirate by Dubai Investments as part of a greening initiative and commitment to the Year of Zayed,” he noted.